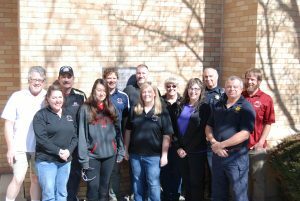 All emergency services in Chaffee County, including fire, police, sheriff, and medical, are dispatched through the Chaffee County Communications Center. The Communications Center employs eleven full-time dispatchers and one full-time Communications Manager. Dispatchers answer several non-emergency phone lines and three 9-1-1 phone lines. Normally, there are two dispatchers on duty, dispatching approximately 24 emergency and non-emergency agencies. Dispatchers go through an extensive on the job training program and must become certified by the Colorado Crime Information Center (CCIC) and the National Crime Information Center (NCIC) within six months of being hired. Dispatchers must also become certified in Emergency Medical Dispatch (EMD) techniques and CPR during their training program. Dispatchers must also become certified in the National Incident Management System (NIMS), ICS100 and IC 700. The Communications Center is the heart of the law enforcement team. The dispatcher is the first link in the chain, and will ask numerous questions of a caller so that they can dispatch the appropriate responder to the emergency. Through the EMD program the dispatcher is able to give pre-arrival first aid instructions to callers, and assist callers to save or sustain a life until the medical personnel arrive. Dispatchers have been credited with several “saves” with choking victims and cardiac arrest patients. The Communications Center was remodeled and equipped with Motorola Centracom Elite radio consoles, and “Sleuth” computer aided dispatch system in early 1999, bringing everything into Y2K compliancy and enhancing the efficiency of the center. With the construction of the new Chaffee County Detention Center in 2003, the Communication Center moved to an office in the same building. 9-1-1 was upgraded in 2009, with Positron Enhanced 9-1-1 software. In 2009 the emergency services began converting from conventional VHF frequencies to a digital trunked radio system, this conversion was a 2 year project, will all emergency services being on DTR radios in late 2010. In 2016, the communications center transitioned from the Code Red mass notification system, to the Everbridge mass notification system. In 2017 the dispatch center will undergo another major change, –with the installation of Motorola MCC7500 radio system and a Viper 9-1-1 system.